We have emerged from winter hibernation. The car has coped well with being inactive for a couple of months. This is encouraging news for the weeks that the car and equipment will spend inside containers when we ship to the United States. The team have decided to develop the control software and work toward a super heated run in the UK. The mono tube boiler design that we have adopted is susceptible to tube failure. We are managing to increase the life of the boilers but realise that damage has occurred as we moved from a manual to an automated control system. 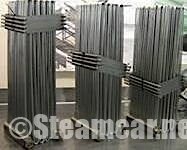 We do not have the time to develop the boiler design and so are constructing spare boiler cores. Now the weather is improving we have one last trip to Thorney Island for testing, before packing up and shipping to America. We are making positive progress with our application to attempt the record at Edwards Air Force Base in California. The Air Force Base covers nearly 308,000 acres, Edwards is located in the Mojave Desert, adjacent to the largest dry lakebed in North America, Rogers Dry Lakebed. They have experienced a particularly wet winter and we could be waiting some time for the lakebed to dry. 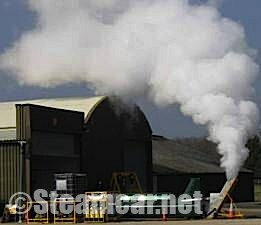 Following a series of successful static and low-speed tests, the British Steam Car will undertake a full programme of dynamic tests on Tuesday 24th March 2009 on Ministry of Defence land near Chichester, West Sussex. This will be the last time the British Steam Car undergoes testing in the UK before it is transported to USA, for an attempt on the World Land Speed Record for steam-powered vehicles. Members of the public will not be admitted on 24 March and only a small number of pre-booked media representatives may attend. Photography and filming will be permitted but the usual restrictions for MoD property will apply. During the day, if weather conditions are suitable, the British Steam Car will run in superheat mode – which should ensure some dramatic images. The braking parachute will also be deployed and for journalists, there will be access to test driver, Don Wales and members of the team, including Project Managers Lynne Angel and Matt Candy. Please contact us now to register your interest in attending – places are strictly limited. You need to tell us your name, the media organisation you represent, the make and model of your vehicle and the number plate ASAP. You will receive email notification, along with directions to the location and a schedule for the day. Entry to the venue will only be permitted upon the presentation of photographic ID – such as a driving licence or passport. The British Steam Car – some background information and previously undisclosed technical information. In 1906, a Stanley Steamcar set a world speed record of 127mph at what is now Daytona Beach, Florida. This official FIA record for a steam car still stands – for now. 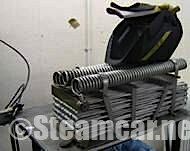 After many years of development, a small British team has completed the British Steam Car, which will attempt to establish a new land speed record for a steam-powered car in 2009.